Ten years of server hosting experience. We have been providing Garrys Mod server hosting now for ten years and have spent thousands of hours into our control panel template. You can easily install CSS or HL2 plus the other repositories content from our mod manager. We also provide a MySQL (installable from the Garrys Mod manager) so you can install mods that require a database. We provide 24-hour Garrys Mod server support just in-case you get stuck, and have the latest servers available from Dell to ensure you get the power you need to run your server how you want. If you have any questions feel free to ask. But rest assured you are with an experienced server hosting company that has been serving Garrys Mod players for a whole decade. I found a cheaper Garrys Mod server elsewhere? Like any service in life, you get what you pay for. This is the same for game server hosting. You are paying for quality performance, quality support and a quality web interface that is both easy to use and responsive. You might find cheaper services out there, but they will not take the meticulous care and attention that we do here at GTXGaming.co.uk. All of our configs are worked on by our group of engineers well before the game is even released. We then add and adapt our control panel template as the game evolves and changes, listening to our user's needs and wishes. Will my Garrys Mod server be online 24 hours a day? Yes, your Garrys Mod server is always online. That is the main reason to pay for game server hosting. All power and network traffic are covered in your subscription so that your server can be online all of the time. Even when your PC is turned off, your clan or community friends can join your server and play in your absence 24 hours a day, 365 days per year. How are Garrys Mod updates handled? If a Garrys Mod server update is released by Garry, all you need to do is click the Steam Update button on our control panel. The server will begin to check your files and update as necessary. Once you are logged in your server may still be 'Installing'. This simply means that your server is updating to the latest Garrys Mod version via a Steam update. After a few seconds, click refresh on your browser and your server will be shown as 'Running' and will be ready for you to configure with your own server title and admin password. Why do i even need Garrys Mod hosting? Well, there are three ways you can host your own Garrys Mod server. You could rent a dedicated server and host a Garrys Mod server on it. This option has some great benefits and we do offer dedicated servers should you go for this option. With a dedicated server, you will get all of the resources focused on one or several servers so you can guarantee the best possible performance. You get root access to the machine so you can easily update the server and run it with a Windows batch file. However, on the downside, there is the initial setup of the Garrys Mod server which can take some time and expertise to get right, as well as updating it when an update comes out. You would also need to install MySQL and configure it. We do offer a TCAdmin2 licence addon which gives you access to our control panel to create servers for only £20 extra per month which will make things a lot easier but with this option enabled you will not get root access (to protect our scripts). The best solution is to rent a server from GTXGaming. Server rental will give you the best value for money. You get the control panel for free, and we host the server 24 hours a day, seven days a week. Rest assured that we do not over populate our machines and your server will run as smoothly as if you had a rented dedicated server. 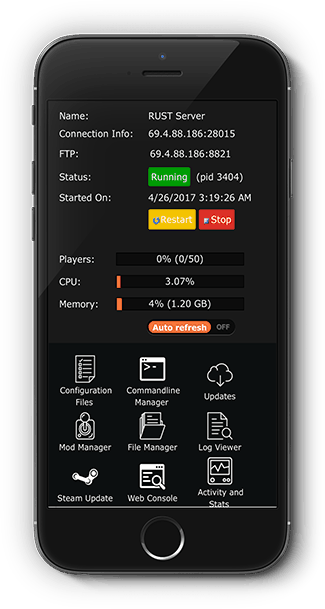 There are also added options of high CPU priority too so if your server is bustling with 100+ players you can add this to get things even smoother and with our 24-hour support you can be confident that you can get your Garrys Mod server up and running in no time. We have a very easy to install repositories like CSS HL2 and so on. We zip up your server on every reboot and upload it to our offsite backup NAS. You will never lose data. We hold data from every reboot for 30 days. We provide a free MySQL database with every single server. So you can install that mod you have always wanted. When you buy a game server from GTXGaming.co.uk you are buying from a company that has had ten years hosting game servers already. Experience is the key to success and we have seen many other companies come and go. At GTXGaming we are online a true 24 hours a day to support you and help you configure your server. With lightening fast response times to boot. You will never be stuck at GTX. At GTX we only use real servers, no desktop parts here. Our reliability is unsurpassed and uses the very best enterprise-grade hard drives. We have not had a hard drive failure in 4 years. 24 Hour no quibble refund. If you order a server from us and are not entirely happy we will simply refund you. 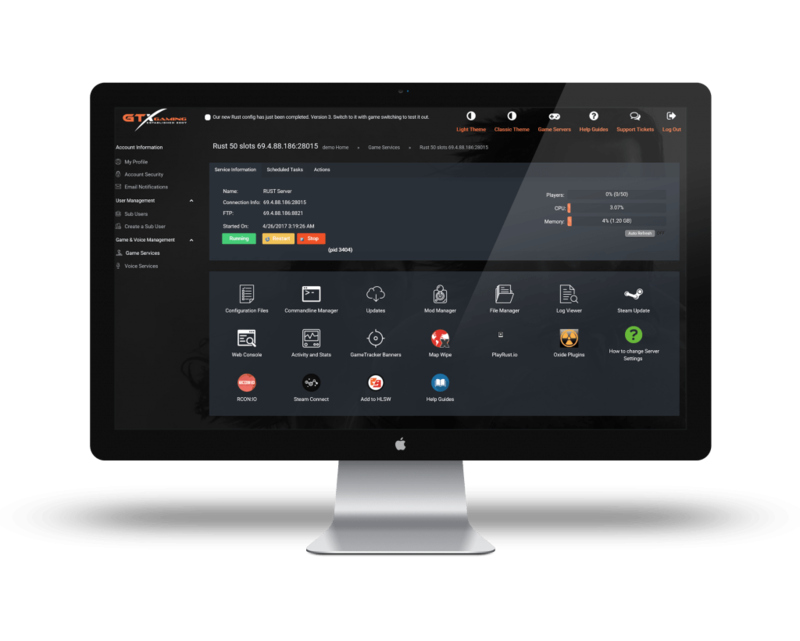 GTXGaming make extensive use of SSL encryption, database password md5 encription and two factor authentication across all of its services. Your personal information is 100% safe with us. While Garry’s MOD is considered a full game, the base gamemode “sandbox” offers players an unprecedented level of freedom that enables players manipulate ragdolls or game props like furniture, containers and even dumpsters. Generally speaking, the game offers so much flexibility that it has no limitations such as specific objectives. Players can select props or ragdolls from any installed Source Engine game and place into the sandbox; the basic idea behind the game is to move the props as dynamically as possible. The game also offers some important tools to facilitate limitless movement such as the Physics Gun which allows users to pick up ragdolls or props and also rotate and freeze them into places. Along with the Physics Gun is yet another important tool called the Tool Gun. The Tool Gun serves multipurpose such as constraining props, generating interactive buttons as well as facilitating the creation of controllable wheels and winches. For enhanced dynamism, the Tool Gun is capable of controlling facial expressions and pose of the ragdoll. Other extra attributes of the Tool Gun include its influence with add-ons created by the games community such that the tool gun can control and use these add-ons effectively. Garry’s mod utilizes a modified version of the source engines called Havok Physics Engine, this allows players to build contraptions (within the laws of physics), thus allowing for a somewhat real life type simulations of experiments and structures. As part of Garry’s reputation for offering an almost unprecedented gaming experience, this game lets users extend the gaming world as dynamically as they please by leveraging on the extensibility offered by the Source Engine via the spam menu. Users are able to spam models and maps imported at their own discretion. Furthermore, players can run their own scripts using the Lua Scripting, a feature added since Garry MOD’s version 9, in a bid to enhance users gaming experience. Thus, users are now able to create their own weapons, vehicles, entities, tools, NPCs and gamemodes. A feature that was not available in previous versions of Garry’s MOD. In multiplayer mode, game servers would attempt to send any new custom content to clients. Some popular modes are Trouble in Terrorist Town, Deathrun and Jailbreak. Prior to 2005, Garry’s MOD was free from the year 2004 until November 27, 2005 when the last free version was released. A year after the release of the last free version of the game, Garry’s node became available on popular digital distribution service Steam and as of January 2016, the game had sold over 10 million copies. Following a Facepunch session with Garry MOD enthusiasts that saw users suggest possible improvement tips for the Garry’s MOD game, the creators decided to do a sequel which has been in progress since September 2015. At completion, the new Garry MOD is expected to have a new hook system for add-ons, sandboxed add-ons, and in-game workshop, browsing/spawning amongst others.